10 Best Bridal HairStyles From 2017 - #Weddingz2017Rewind! 2017 witnessed some really great Indian weddings and we saw brides going all the way out to curate their bridal looks. We came across a few brides who really inspired us with their bridal hairstyles which totally make for 2017 trending hairstyles! 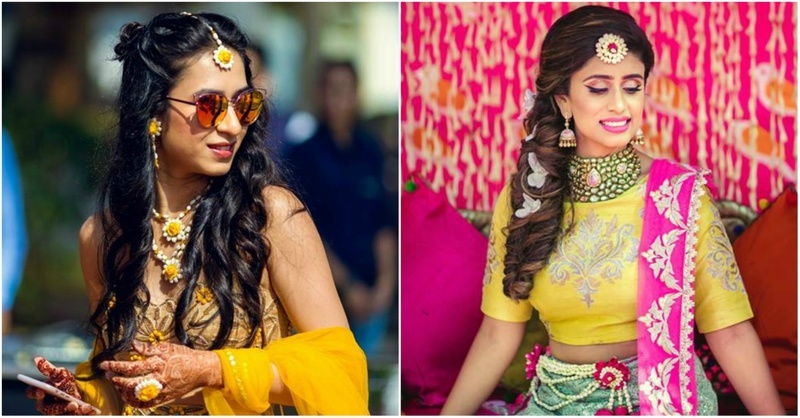 After our best Wedding lehengas, bridal makeup, cocktail outfits , best mehendi outfits articles of 2017, we are now doing a roundup of best bridal hairstyles we spotted on real brides in 2017. Whether you want to achieve a dramatic look at night or to keep it neat and light during the day, our curated list of best bridal hairstyles of 2017 real brides will have you turning heads at your 2018 wedding and pre-wedding ceremonies! With the #Virushka fever still going strong we are not yet over Anushka Sharma's wedding hairstyle. She sported a bridal bun for her private wedding at Tuscany. Her bridal hairstyle had the most beautiful roses and hydrangeas in ivory and powder pink making her look stunning. So simple and yet so pretty, this double boho braid with tiny cascading flowers is #HairStyleGoals. It is the perfect hairstyle for long hair as it stays intact the whole day without any need to fuss around with it. Elegant, chic, sleek and smooth, we really can’t get over this bride’s classic wedding hairstyle - a bridal bun with a pomp towards the front. It’s really hard to take our eyes off this voluminous fishtail hairdo and the flowers in her braid are just the icing on the cake. Simple and effective this fishtail side braid is perfect for a vibrant day function at your wedding. Now here’s another stunner sporting the most trending hairstyle of 2017. Her twisted and bubbled fishtail braid with yellow flowers in every bubble is just too cute to handle! Her wedding hairstyle is giving us Disney princess vibes all the way. - The pull-through fishtail braid! How cool is this bride’s braid braided in a side braid (no it’s not a tongue twister)! We are going nuts over how her hair colour is highlighted in her wedding hairstyle and those dainty hair accessories are taking the whole look up a notch. If you are looking for a more delicate & elegant bridal hairstyle, then this bridal bun you will definitely fancy you. This bride has paired real roses with her oh-so pretty rose-bun and we say it really doesn't get any better and neater than this!! All you brides looking for something to do with curly hairstyles, this one is the perfect pick for you! We love this bride’s cascading waterfall braided hairstyle with curls all the way. That delicate hair accessory co-ordinated with her wedding attire is bringing the whole look alive. All the lazy girls in the house listen up! If you want to just let your hair down and dance your way at your wedding, without being constantly worried about ruining your wedding hairstyle, we have got you covered. Bipasha Basu looked like a boho princess on her mehndi day! We can’t get over how beautifully her tiara complemented her mehndi attire. Perfect for a day filled with classes, this half bun with curls all the way is chic, simple, and doesn't take a lot of time to do! Honestly, what more could you ask for from a hairstyle for long hair? We are totally eyeing this bride’s modern and chic hairdo with the floral accessory complementing her attire. Here’s another apt hairstyle for long hair - This bride looks absolutely stunning in this hairdo. The braids are rolled up into a bun to create an illusion of voluminous hair, perfect for someone who finds it difficult to style their fine textured hair. Now that's a hairdo like no other! Long strands of mogra and roses that go all the way, making this bride’s wedding hairstyle totally unique. So girls, there’s a lot that you can do with your bridal hairstyle, however when you don’t have inspiration it’s easy to fall back on the old ponytail / normal bun. Just so you don’t, we went ahead and curated this list of best bridal and trending hairstyles of 2017. We hope this list will help you narrow down on which one would you opt for your 2018 wedding. Whichever wedding hairstyle you decide to go for, just make sure it makes you feel very much ‘you’ and allows you to be fuss free & comfortable during your wedding ceremony!